all the amenities needed for families of all ages. Please take time to explore our website and find out all you need to know about our beautiful town. If you have any questions or require further information please contact the Town office on 705-785-3493. - Read the latest Council Minutes. - See the Agenda for the next council meeting. - 2018 - 2019 Recycling Calendar. Parking is prohibited on any street in the Town of Bruce Mines between November 1 and April 30 each year to facilitate snow removal. Any vehicle parked on municipal streets during this period may be towed at the owners expense. No person shall deposit snow or ice on the roadway withoutpermission in writing to do so from the Ministry or the road authority responsible for maintenance of the road, R.S.O. 1990, C.H.8,s.181. Until such time that we are able to resume our weekly hours, the Transfer Sites at Rose Lake and Thessalon may be used, provided you present your Tri-neighbours card. 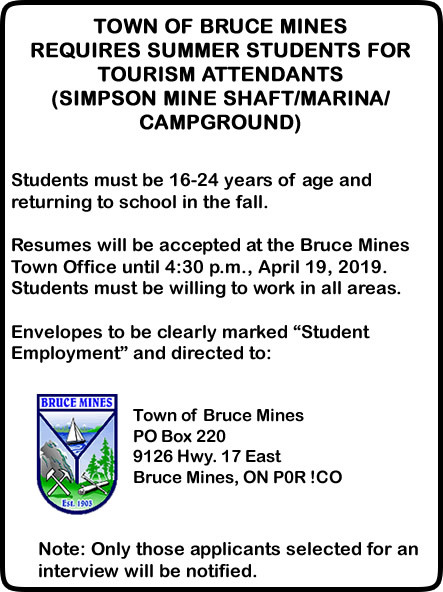 Summer students required for Tourism Attendants at the Simpson Mine Shaft/Marina/Campground. Saturday June 8 at the Waterfront.